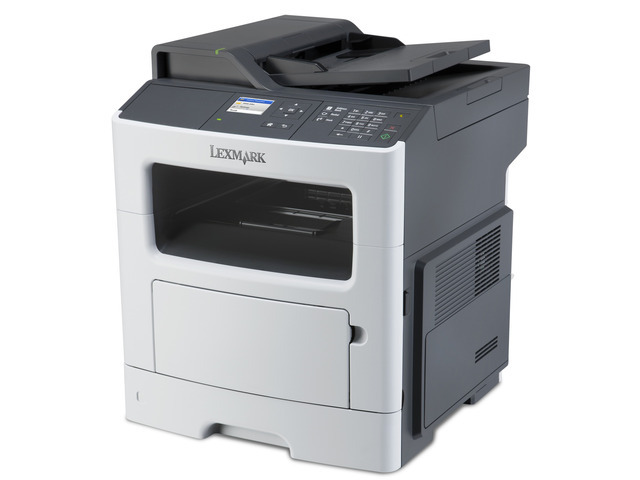 The new line of the Lexmark MFPs is rather wide, with MX310dn being the starter model. Even though, the machine possesses broad functionality and is perfectly equipped. The model is compact and takes not much space (could be put on a table—in a basic configuration it weighs 20 kg, so it is quite possible). MX310dn is developed for the small work groups, and its configuration could be upgraded. Main tray with a capacity of 250 sheets can be extended with an additional tray of the same capacity or with a capacity of 550 sheets. The output tray is made in the form of a convenient through niche (capacity of 150 sheets) and equipped to hold the prints. Above the main tray, there is a 50-sheet multipurpose feeder, it is very convenient for occasional printing on non-standard types of paper. The main tray allows printing on standard A4 paper as well as on Letter, Legal, A5, A6, etc. And the multipurpose feeder helps to print on envelopes, forms, cards, labels and other types of paper. The forward panel easily opens with the help of special button and gives the access to a cartridge. The MX310dn copies with the resolution of 600 x 600 dpi and prints with that of 1200 x 1200 dpi. Images can be printed with the resolution of 1200 and 2400 dpi. With 800 MHz processor and 256 Mb memory, the MFP can speed up to 33 ppm in simplex mode for printing and copying and 17 ppm—in duplex mode. The the first copy out time is only 6,5 sec. When copying, document can be scaled from 25 to 400%. MX310dn belongs to the newest Lexmark line and supports work with the latest operating systems, such as Microsoft Windows 8 and Microsoft Windows 2012 Server. Certainly, there is a full compatibility with the other MS Windows versions: XP, Vista, 7. Besides, broad support of other operating systems is provided: Apple Mac OS X, Novell, Linux (11 families), UNIX (4 families), Citrix MetaFrame. The scanner is located on the top of the device and has an automatic feeder (ADF) with a capacity up to 50 sheets. It can be used when scanning, copying and sending faxes. Color scanning is provided with the resolution of 600 x 600 ppi, and monochrome — with 1200 x 600 ppi. The output formats of JPEG, JPG, PDF, TIFF, XPS are supported. Together with scanning to the USB port or computer, connected via LAN, one can send the scanned output to an e-mail and by FTP, record on a flash disk. Among the standard interfaces of MX310dn are USB 2.0 (type B), Ethernet 10/100BaseTX (RJ-45), telephone line and answering machine connection slots. silent mode — 49 dB. As a whole, the Lexmark MX310dn makes good impression thanks to compact and stylish design, convenience of operation and high speed. The cost is rather low, especially with such additional bonuses as the availability to expand the configuration and descend of the higher level of performance and convenience. This entry was posted on Sunday, November 17th, 2013 at 4:46 am	and is filed under laser, Lexmark, multifunction. "The Cube, Personal 3D Printer"
"Xerox DocuMate 5445 and 5460 Scanners To Speed Up Paperwork In Office"